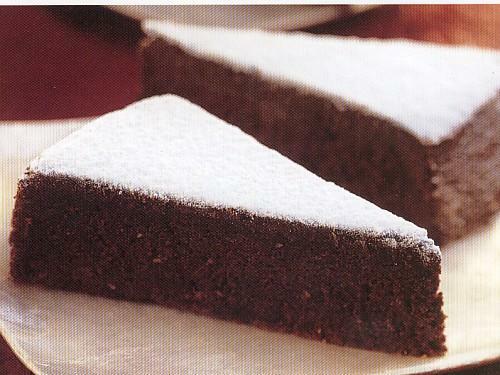 The Irma of my novel lived a half-century before the probable dawn of Torta Caprese, the dense and delicious flourless chocolate cake whose link with the island of Capri is more gastro-hype than real. Most likely Irma never tasted chocolate until she came to America. But that was then. In honor of a giveaway sponsored by Mirella Patzer’s Historical Novel Review blog, here’s a recipe for Torta Caprese, a frequent finale at our house. I always add a non-traditional embellishment, but nobody seems to mind, there being little to mind in Grand Marnier. Preheat oven to 350 and butter a 10″ springform pan. Combine almonds with 1/3 C sugar in processor until very fine. Dump in large bow. Again in the processor (you don’t need to clean it) process chocolate and 1/3 C sugar until the chocolate is finely ground. Add to almond-sugar and mix well until the color is uniform. Melt and cool butter. Meanwhile, in separate bowl, with electric mixer, combine egg yolks with sugar until thick and foamy. Add egg mixture to the chocolate-almond-sugar mix, then add almond extract and lemon peel. Add melted, cooled butter and mix well. With clean, dry beaters, beat egg whites with salt until stiff but not dry. Add to chocolate mixture in three additions, folding in carefully. Your goal is that the mixture be reasonably uniform without deflating the egg whites. Pour into prepared pan, smooth, bake. Check at 35 minutes with cake tester. Some crumbs may cling, but the center shouldn’t be wet. You may need to give it a few more minutes. Cool about 10 minutes before removing sides. Decoration: When cake is cool you may dust with confectioner’s sugar. You can just use a sifter. However, I often make a simple stencil, maybe an initial of the guest of honor (or the cook), or something else. I’m not that good with scissors, but you can be fancy if you like. Stop here if you want the classic Torta Caprese. But you may also offer . . . Put frozen raspberries in saucepan. Add sugar and cook over low heat until berries are thawed and sugar melted. Put some juice in a small bowl, add cornstarch, combine, and put back in saucepan. Cook a bit until thickened. Cool and add Grand Marnier and lemon. Pass with the cake. Your friends will be happy. You can be happy again at breakfast if you have leftovers.